A Tres is a 3 course instrument similar to a guitar - it is one of the main instruments in Cuban music - more info at "The Tres in Cuba"
"The Tres is generally unknown among many otherwise knowledgeable fans of fretted stringed instruments, yet it is a vital expressive tool that has shaped the sound of Latin American music since the last century. Note: Cuban tres players often call themselves treseros; while Puerto Ricans playing the tres often call themselves tresistas"
A customer who is a regular six string guitar player went to Cuba for a holiday and really enjoyed the local music scene and had some lessons with a cuban tresero. On his return he wanted to carry on with the tres and came to me with the idea of converting a cheap nylon string acoustic. As the stringing arrangement of the tres requires six machine heads it is a relatively simple process to change a classical or spanish guitar from six single strings to three pairs of strings. All that's required is to cut three extra slots in the nut and six slots in the bridge saddle. As my customer had decided that he was going to use a capo at the second fret the depth of the nut slots was not critical - I would recommend this approach as it makes a DIY job much simpler. 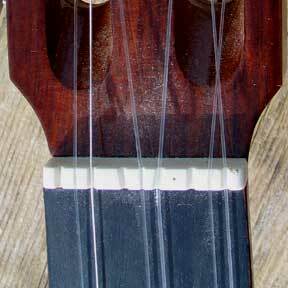 If you don't want to use a capo or don't feel competent to cut the slots you could get your local luthier to do this. I used needle files to cut the slots but something like a small hacksaw could do the job. The reason for using strings 1,3 and 5 rather than using the whole width of the neck is that you can use the existing holes in the bridge to hold two strings each - this is much simpler than having to drill new holes but it does mean you have to cut six small notches in the bridge saddle to keep the strings of each pair apart. In Cuba the tres strings are normally metal and I'm sure this conversion would work with steel strings - however my customer wanted to use nylon strings as that's what he normally uses on guitar. 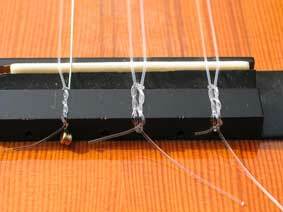 We used 2 top E strings and 2 B strings from nylon sets for the top 2 pairs. These are tuned in unison. 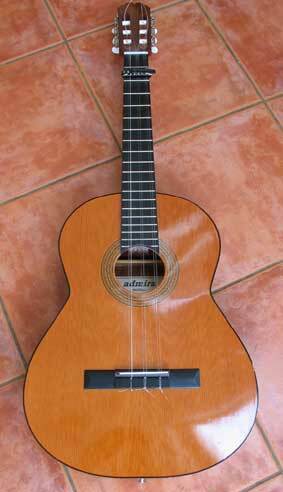 For the 3rd pair we used a top E nylon string plus a wound "silk and steel" 3rd string. This pair is tuned an octave apart with the highest note at the bottom. This conversion is completely reversible so you can get it back to being a regular guitar just by re-stringing.